Thankfully man didn’t just discover fire …… We invented the jacket too! As you can see from browsing through our online brochure we have a massive range of work jackets & coats suitable for the full range of UK weather. But who wants to trawl through 200 different types of jacket in the hope of finding the one you like, that will keep you dry & warm? So here’s some recommendations! Light weight shell jacket: We’re real fans of the Russell 510 as a softshell work jacket. 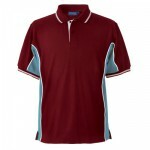 It comes in both unisex & ladies fits as well as a childrens version in a range of colours. 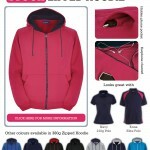 It has a great range of features & accessories including a fold away hood. If you’re looking for a great quality lightweight work jacket you can’t go wrong with the 510 series. Our other recommendation in this range would be the Result RS111 range. Again available in both unisex & ladies fit the RS111 has a similar range of great features including availability in moss coloured finish which is ideal for those working in a countryside environment. Both the 510 & RS111 ranges come in at under £50 including embroidery so as well as being stylish & practical they’re not breaking the bank. 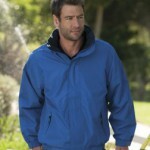 Soft Shell Jacket: The range in soft shell jackets just keeps growing & growing. 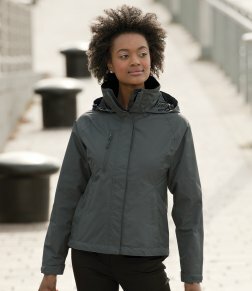 The mix of the weatherproof polyester outers with weatherproof membranes & micro fleece lining proves to be a winner where customers want to be warm & dry without the associated bulk of full fleece lined or wadding filled jackets. It’s pretty hard to spot massive differences in the quality of the soft shell range, but for us the Result range has the edge in feel, look & most definitely price. Coming in at £35 including embroidery The RS121 comes in unisex, ladies fitted & kids versions, features decorative yokes as well as a zipped chest pocket. 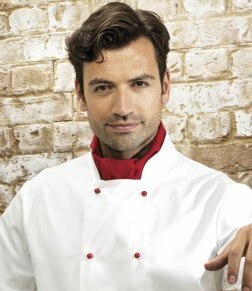 The smart business look is ideal for a whole range of industries & adds a real professional look to a workwear jacket for your staff uniform line. Mid-Weight Jacket: This one has a sure fire winner. 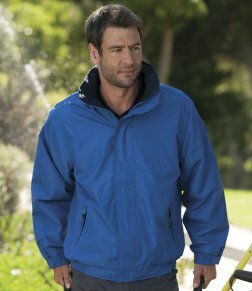 Of all the hooded softshell jackets, the Regatta Dover jacket is the solution when a waterproof work jacket, insulated by a fleece lined body is needed. 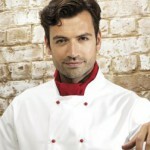 It has an integrated fold-away hood & comes in a range of 7 colourways to match almost anyone’s requirement. Elasticated cuffs & a full front storm flap boosts the waterproof integrity of a high range, sensible priced (Just £30 – honestly!) jacket which features both a phone pocket as well as an internal security pocket. This entry was posted in Jackets, Workwear and tagged borders, Cumbria, jacket, softshell, work jacket, workwear on 9th November 2015 by admin. Get ahead and get a hat! When people think embroidered workwear hats, they tend to think of fast food places and baseball caps but, especially for the climate across the North of England, there’s a much better alternative and that’s the beanie hat. It always used to be said that people lost most heat through their heads in cold weather but recent research has shown that it’s a bit more complicated than that. 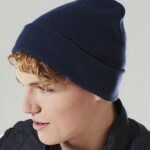 The Biology of the Beanie Hat and Heat Loss! In fact, we lose about 10% of our warmth through our heads – which is roughly what you’d expect given the surface area of our scalps. 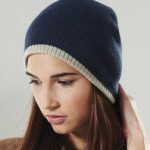 But, before you throw away those woolly (or fleecy) hats, there’s still research to support the benefits of a beanie: when the head is allowed to get cold and the body is effectively insulated, the body’s core temperature drops a lot more rapidly than most people expect. This is because the scalp contains lots of blood vessels and they’re close to the surface on your head. So, even if you’re dressed warmly on a cold day, without a hat, the blood flowing around your head will cool and then return to the body, reducing your core temperature and making you feel cold. “Our beanies seem to be most popular with haulage firms, builders and agricultural merchants,” says Richard. “There’s an obvious use for outdoor workwear, but they also buy them as gifts and giveaways for their customers. 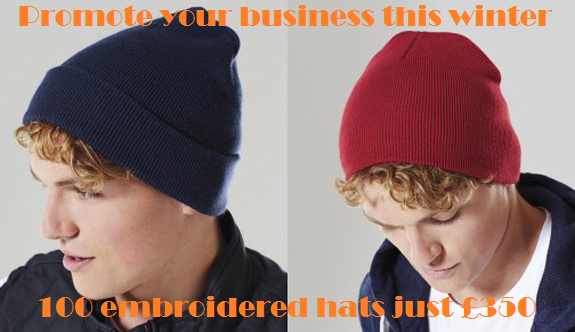 I’m not sure how much difference the amount of hair makes to heat loss but I can’t help thinking that our embroidered beanies make an even bigger difference when your staff or your customers need an extra bit of protection to the top of the head!” And with the proximity of the Lake District National Park – you can bet your beanie hat that plenty of heads will be bobbing around the Lakeland fells in winter wearing your brand! This entry was posted in headwear, Promotional, Workwear and tagged beanie, embroidered, hat, workwear on 23rd October 2015 by admin. Be seen and be safe as clocks go back – it’s Hi-vis time of year again! 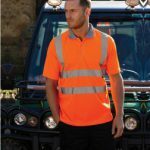 Hi-Vis Jackets and workwear are essential if your staff are going to be seen clearly at work and that’s important for all sorts of companies in the autumn and winter months. Whether your staff are travelling to work in dark, working on site at dawn or dusk or leaving site in the darker evenings, they need to be seen, to be safe and we’re happy to work with businesses to come up with options that fit with your other embroidered workwear packages. Hi-Vis Waistcoat with reflective strips. ideal for quick on / quick off situations in the dark Cumbria winters. High visibility at Stitch & Print isn’t just about the basic traffic jackets, bomber jackets and vests either – although we have a great selection of those to meet most business needs. 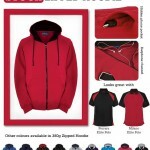 Stitch & Print also carry a range of Hi-Vis sweatshirts, Hi-Vis hoodies, and bodywarmers, available with long or short sleeves as well as a range of colours, and we’re in the business of personalising and branding those with print or embroidery too. Whatever the needs of your workforce in the winter months, we can come up with options that fit into your standard workwear packages. Our range of high visibility workwear includes a full range of motorway coats, bomber jackets, bodywarmers, 3-in-1 jackets , 4-in-1, 5-in-1 even some 7-in-1 jackets, – those are the ones with the zip-in fleece liner that can be worn separately to add weather dependent options to your wardrobe – and we have over trousers too, to keep your work force seen, dry and warm even in the most extreme weather. Another trend in hi-vis clothing and workwear is headwear – hats to you and me. Fluorescent yellow and fluorescent orange caps & beanie hats with reflective materials on the brim are proving popular and the same sort of approach is also being designed into bump caps and safety hard hats too. This entry was posted in Hi-Vis, Workwear and tagged Cumbria, embroidered, hi-vis, high visibility, printed, safety, workwear on 22nd October 2015 by admin. 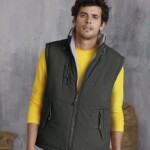 Get a bodywarmer – add an extra layer for winter warmth! Whatever you call them – gilet, bodywarmer, fleece waistcoat, sleeveless jackets – as an extra layer, they’re invaluable when the temperatures drop and the weather cools and deteriorates. 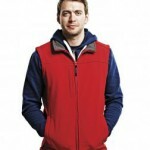 To use the dictionary definition, a gilet is a light, sleeveless, padded jacket but the terms tend to be interchangeable when discussing workwear and outdoor clothing. 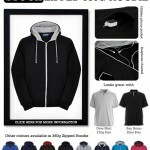 So whether you require a padded bodywarmer or a fleece one we’ve got plenty of options; Take a look in our online brochure. The Stitch & Print range includes padded and quilted gilets for the outdoors, fleece bodywarmers in a broad spectrum of weights and colours to match other workwear and woven sleeveless jackets with plenty of pockets so that the wearer can keep things secure during the working day. Some versions incorporate reflective or high visibility materials while others are simply designed for warmth and versatility. This entry was posted in Fleece, Jackets, Workwear and tagged bodywarmer, Cumbria, embroidered, fleece, jacket, softshell, work jacket, workwear on 21st October 2015 by admin. Whether it’s a vocational college course in Carlisle, a modern apprenticeship in West Cumbria or just a change of job, new starters need new uniforms, workwear and safety PPE. 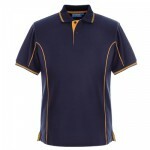 A Diverse Industrial Sector – Diverse Workwear Needs! At Stitch & Print, we have customers across all sorts of business sectors so we might be working on the embroidery for a beauty salon’s staff one day and then branding hi vis workwear for a construction company the next with chef’s whites to finish the week! We’re known for our uniform packs as these offer standard combinations of popular items such as fleeces, polo shirts and trousers but we pride ourselves on our flexibility and can put together whatever a business needs. 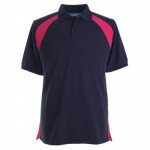 For instance, while polo shirts have always been a staple of the Stitch & Print business, there is a trend towards smarter work shirts – we offer both options in a range of colours and our Wigton-based machines are set up for embroidery on breast pockets, sleeves, whatever. Being based in Cumbria and with the Lake District on our doorstep, we have a lot of customers working in the great outdoors and, as you’ll know, that means being prepared for all weathers. We work with suppliers such as Regatta, Professional and Stormtech to offer a range of outdoor wear, from waterproofs and warm jackets, to quilted bodywarmers and abrasion-resistant fleeces. With all that outdoor action going on and with people coming from far and wide around the globe to admire the lake District and Eden Valley’s stunning scenery, there’s a huge hospitality trade with a steady turnover of staff. From chef’s uniforms to aprons for bar and waiting staff, every establishment likes to create its own special ambience and the ability of Stitch & Print to cater to a constantly changing specifications list, brings hotel and restaurant owners back time and again. There’s also a lot of construction going on in and around Barrow, Whitehaven and Workington so we can combine workwear orders with PPE and high visibility clothing to give companies a one stop shop. 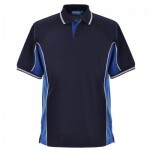 Boiler suits with embroidered polo shirts, hi vis vests with tough work trousers – whatever the combinations: with access to most of the key suppliers in the country, Stitch & Print can deliver. If you’re considering providing staff with workwear for the first time or you need a refresh; or just need to provide a package to new starters, please get in touch. We’d be happy to put together ideas and costs to give you what you need. This entry was posted in Workwear and tagged Cumbria, embroidered, uniform, workwear on 29th August 2015 by admin.